Our new KS2 curriculum is being developed with the children through 12 imaginative learning themes taught over 4 years. The first and new to 2018 is 'Rainforests'. Follow now to discover a rich menu of exciting and motivating learning activities that share creative links between all aspects of our children's learning in Key Stage 2. We believe that children learn best when they are encouraged to use their imagination and apply their learning to engaging and exciting contexts. Our new curriculum will provide learning opportunities that will require challenge, problem solving, creativity and the chance to express knowledge and understanding across all curriculum subjects. add to this fantastic workshop experience! The whole school will enjoy the opportunity to meet a range of animals linked to their topics. Each session will allow the children to discuss the different types of animals that live in the rainforests. A range of exciting animals native to rainforests will visit the school for the children to see. 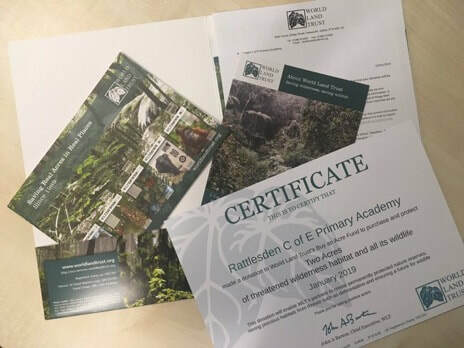 KS1 children will think about why we have zoos, the importance of conservation and animal welfare, as well as learning about the different animals they will be meeting on the day. Come into school to share with your children some of the learning that has taken place this term. Celebrate our new creative curriculum and take the opportunity to test your own knowledge of this important area of our world! has kindly been funded by FORS. "Writing facts and a story about the rainforest animals has been fun. I like imagining things and writing them down"
"I have learnt that a Venus fly trap closes and fill up with acid when a fly has flown in. It eats it!" "Im looking forward to writing poetry about the rainforest"
​"We could act out that we are in the rainforest!" ​How are we assess this learning? Our school’s creative curriculum engages all our pupils so that their experience of school is rich and exciting. We ensure that they have the opportunity to learn about the wider world and their role in it. The school’s values permeate through our curriculum content and delivery. Topics are often taught through the creative approaches of drama, art and music and outdoor learning is weaved into lessons as appropriate. ICT is used to collate and record information. Visits out of school and visitors to school are seen as an important aspect of our creative curriculum and records of their value kept through photographs and comments from pupils. and found in their writing books. The school is developing a range of methods of recording and assessing the whole curriculum which includes: Class books and displays, school living displays that grow as the topic develops and opportunities for children to share their knowledge and understanding with others. Subject leaders assess the impact of their subjects through talking to children about their learning, examining work completed by pupils and the presentation of knowledge and understanding of a topic through a range of media.